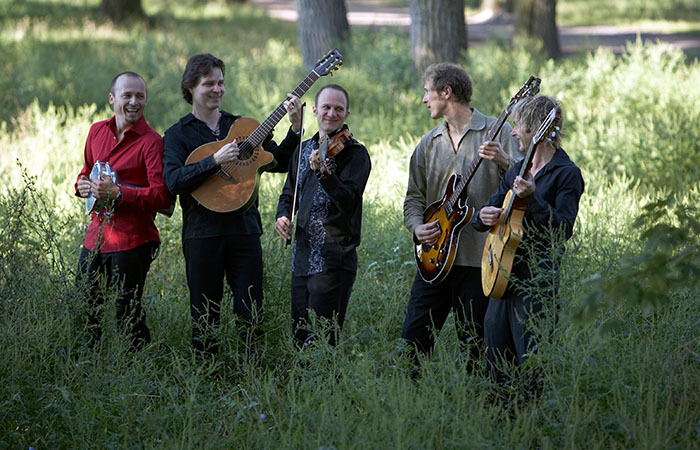 Sultans of String is a Canadian World Music ensemble created in 2009. They have released four albums so far. Their latest recording -entitled Symphony!– was recently released and it’s already garnering attention and being praised as a wonderful project in which the ensemble (a quintet) is joined by a select number of special guests and a symphony. Yes, a 50+ members symphony orchestra. The result is magnificent, to say the least. Symphony! will be presented in Toronto on December 1st, 2013, at Koerner Hall (Royal Conservatory of Music). 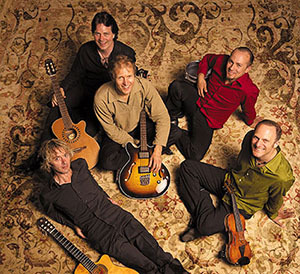 WMR: Tell me a little bit about Sultans of String, the concept behind the group, the beginnings, when and how did you get started? 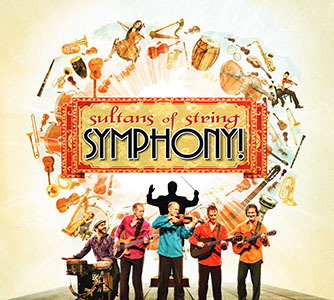 Sultans of String started about 10 years ago. I met Kevin Laliberté, he was just coming out the road playing guitar with Jesse Cook. They were doing the Rumba Flamenca style and I also met, kind of around the same time, our bass player, Drew Birston, in a jazz context. Drew is a really cool player because he’s really well versed in the jazz world. He studied jazz at McGill, and he’s played all over the world with jazz artists, but he’s also played at large pop stages, with artists like Chantal Kreviazuk and Melanie Doane. So he really has a good sense of big stage, movement and arrangement. At the beginning it was Kevin and I and then adding Drew into the mix, and I was playing gipsy-jazz violin with a group called Club Django in Toronto. So, I was doing this gipsy-jazz style, and you know, when you’re a violin player it’s hard to get away from some exposure to fiddling, and also my interest in Arabic music, because of my father’s heritage. So, I studied a little bit Arabic violin, and travelled down to Massachusetts to a wonderful school called ‘Arabic Music Retreat’ that they hold in the summer with some incredible players and teachers. And then, we picked up other musical friends along the way. 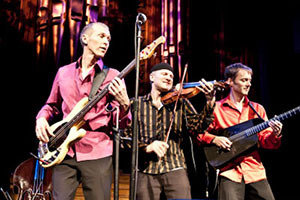 Robert Michaels, Eddie Paton, who has played with Johannes Linstead and Robert Michaels as well. Then came Rosendo ‘Chendy’ León, who tours with Jesse Cook, and has played and recorded with Alex Cuba, Amanda Martínez and one million other artists. So, we put together a little bit of a supergroup. Currently, Sultans of String are: Kevin Laliberté on guitars (electric, nylon string, steel string), Drew Birston on acoustic and electric bass, Eddie Paton on guitar (nylon string), Rosendo ‘Chendy’ León on percussion and drums, and myself on 6 string violin and vocals. WMR: You’ve been together for around 8, 9 years, since 2004. Is that correct? Yeah, with Kevin and Drew that’s correct. Then we started bringing on the other players, maybe around 2009. WMR: So, it’s been around 4 years as a group. Yeah, sometimes we play as a duo, just Kevin and I. When we’re touring in the states, in places where they don’t know us as well, or in smaller venues, we go as a duo, or as a trio. And sometimes we play as a full band, 4 or 5 of us and sometimes we get to play with symphony orchestras, at 50, 60, 70 musicians to the mix. WMR: Your music defies categorization, your influences are varied and the scope of your sound is wide and global, but being called a World-Jazz-Flamenco band seems to represent your sound, isn’t it? Yeah, World-Jazz-Flamenco does it, but you can almost say that we are a World Music band because, unless you live in another planet, you would include your kind of music. For me the music from the East Coast of Canada is World Music, the Quebecois music is World Music, Ontario fiddling is World Music. You know, World music it almost means roots music, anything that’s not pop or rock, and or opera. Yeah! It was really a complex project to put together, I mean, even to find the musicians was a challenge because we wanted to use the best orchestral musicians in Toronto. We had to pick a day when the Toronto Symphony Orchestra, the National Ballet were not working, so, we waited quite a while until we found that window, and we got it we grabbed it and went into this recording studio called Revolution Recording in Toronto, and it’s a very big recording floor, it’s a very impressive studio, it’s like world class. The engineer we worked with is Gary… he was an amazing engineer because he sound checked the entire orchestra in about twenty minutes, we did so much advanced work that by the time the orchestra got there they just had to sit down and pretty much play. WMR: Let’s talk about the songs. Especially those songs that you feel represent you the best on this album. For me the music is all about telling stories, even though it’s instrumental music, your sound has a story; so, one of them is about Luna the whale. ‘Luna’ is the killer whale in the Nootka Sound near Vancouver Island. The Mowachaht/Muchalaht First Nation believed him to be a reincarnation of their late chief Ambrose Maquinna and this song is dedicated to him and to the spirit of that beautiful whale. One song is called ‘Road to Kfarmishki’. It’s inspired by a trip that I took with my father… and ‘Sable Island’ is also inspired by a true story. ‘Sable Island’ is literally a sandbar island located a couple of hundred kilometers from the southeast coast of Nova Scotia, and for hundred of years ships have been crashing on Sable Island, they call it the graveyard of the Atlantic. About 500 years ago the legend goes that a ship capsized and all the people perished, but the horses survived, and it’s actually truth, because they stayed there. There are some 300 horses running free on Sable Island, so we wrote a song inspired by that place. There’s also a song called ‘Josie’… and another one called ‘Monti’s Revenge’. I wanted to do a song inspired by the Hungarian csardas tune by Vittorio Monti, which is one of the most famous Hungarian tunes but written by an Italian. ‘Emerald Swing’ is kind of a mash-up that really represents us. A mix of a fiddle tune with a Gypsy-jazz rhythm. WMR: I love that tune (‘Emerald Swing’). Joyful and very uplifting. WMR: Except that you didn’t have the Symphony… What are the best and most difficult moments with the band that you can recall. Best moments? The first one is for sure when we’re performing live, you know, one thing that most people don’t realize is that there’s so much behind the scene work involved when you are a musician. I wish most of it would be performing live, but it’s not like that. There’s so much emailing and faxing and phoning involved, searches in google and mapquest. There’s hours and hours of that every day, so, when we’re really up on stage and get to play together, that’s the really joyful part for me, because there’s no phone to answer, no emails, no faxes, no google… it’s just me and the violin and the band, and then the music being played. The most difficult moments would be when we’re driving, we have to get up at 5 o’clock in the morning and drive eleven hours to get the gig, whereas mapquest says it takes seven hours to get where we’re going and we’re so afraid we’re gonna miss the entire show. That’s the hard part. WMR: Let’s talk a little bit about the show you’re putting together at that magnificent venue, Koerner Hall, on December 1st. Yeah! And… I’m really looking forward to it. WMR: you’re gonna be presenting the music of ‘Symphony!’ on that night. Oh yeah! We’re gonna play every song from the album plus a lot more. We have 15 orchestra charts composed. Perhaps we won’t do all 15 charts, but it’s gonna be a very big night of symphony music. Our fans base is mostly the World music and Jazz crowd, and they might never go out just to see a symphony, so you know, we share that wonderful sound with them. On the other hand, I know there’s a lot of people coming who likes a lot the orchestral music, but they haven’t had that much exposure to World Music or Jazz. So, for them is really gonna be fun to hear us in that context, mixing both worlds. WMR: Is it going to be the official launch of the ‘Symphony!’ album at Koerner Hall? WMR: You’ve been around already, touring. Yeah, we’ve been really busy. We’ve been doing the Symphony! show right across the country this season. And of course we still perform as a duo, trio, qurtet, quintet right across North America, but this is the first time that we perform with a symphony in Toronto, so, it’s very exciting for us. WMR: It’s gonna be a sold-out show most probably. Oh! I hope so. There’s so much going on in Toronto, but this is gonna be a very special show. We really appreciate your support publishing this interview and raising awareness about the show. WMR: You’re very welcome! How’s the album being received so far? Any reviews already out there? Yeah! People love it. We’ve been getting tons of review in the US and Canada. It’s really heartening to see people’s reactions to it. It’s a very different sounding record, you know. Not too many World Music bands have recorded with a symphony like that. I got so involved in the project, of course every artist… you know, every artist dive into it and you try to make the best piece of art that you can, and you’re not really making it for other people, but you really hope that they like it. WMR: I’m aware of all the hard work to have the project completed, the fundraising, the grants applications and all that. Yeah! It really was. We were doing pre-sales for a year trying to raise the funds to complete the project, and because I really wanted to record here in Canada, it was quite expensive. I was looking to Toronto Arts Council, Ontario Arts Council, Canada Council, Factor… and I was lucky that all the levels of funding came through, and still doesn’t cover the whole cost of the production. It only covers a portion of the cost, but, without the Arts Councils support we wouldn’t have been able to make a CD like this. You know, we’re very lucky in Canada. I don’t think people realize how much the government supports art in this country, and it’s a wonderful thing. It’s the kind of album that would be pretty much impossible to make in the United States because they don’t have the same kind of funding to help with projects like this. So, we’re very grateful for everyone who pitched in, not only the Arts Councils but individuals who thought, hey, this is kind of a groovy thing, a little bit crazy looking but, you know, I’m gonna take a chance. And buying an album in advance, that really helped us out. WMR: Thank you Chris for your time and for sharing your thoughts with our readers. 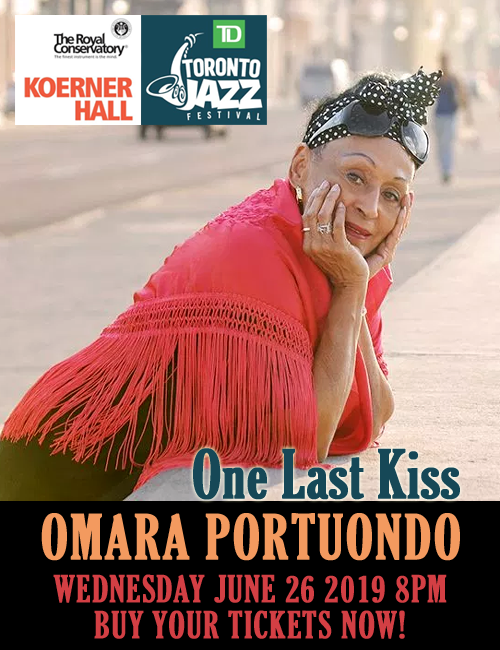 Founder, Editor and Webmaster for Latin Jazz Network and World Music Report. Danilo is a passionate and committed communicator with a sensibility for the arts whose hometown is Toronto, Canada.